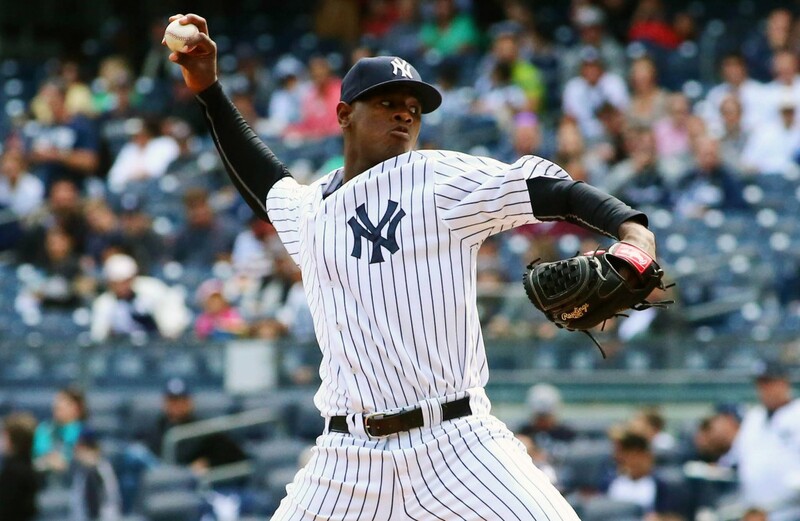 Without a dominant Luis Severino, it won’t be easy for the Yankees to do much damage in the postseason. How he went from potential Cy Young award winner earlier in the year to a drag on the staff every fifth day has been one of the 2018’s biggest frustrations. Though he seemingly pitched a tad better in his outing this past weekend against Toronto, he certainly isn’t out of the woods yet. It’s been nearly two months since we’ve witnessed a vintage Severino performance, and each subsequent start adds to the anxiety about when he’ll finally span out of it. Questions about pitch tipping and fatigue have been raised, though the Yankees haven’t made it clear what they feel is causing Severino to struggle. 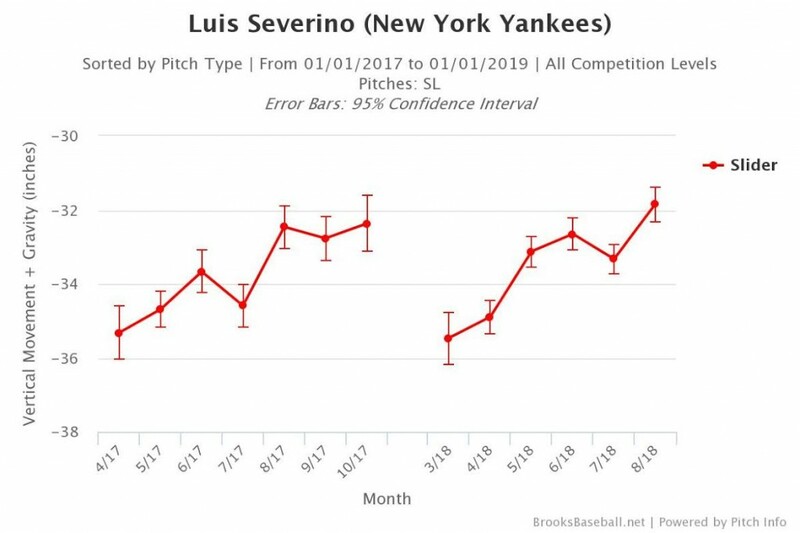 Whatever the issue is, certain stats are pointing to the ineffectiveness of Severino’s slider. Mike Petriello broke down the trouble that Severino has had in recent starts, particularly discussing how his slider has evolved throughout the season. 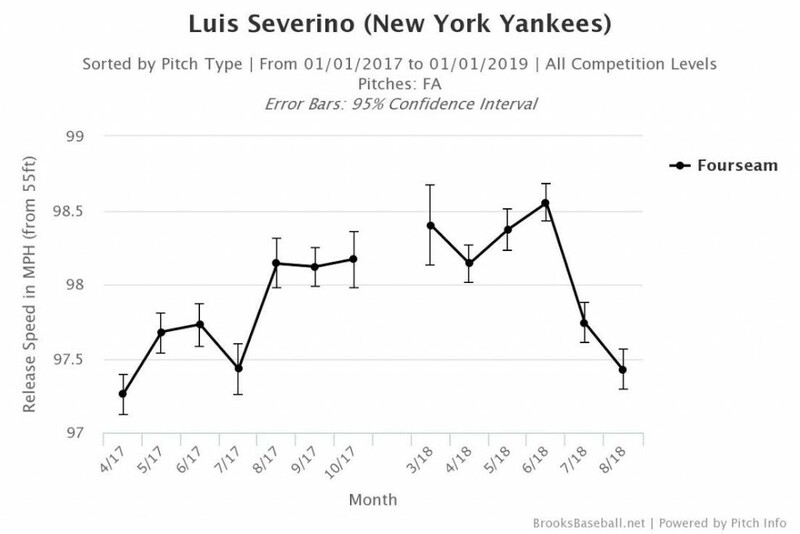 Most notably, Severino’s experienced negative trends with his slider’s movement and spin rate, which has made the offering less effective. Petriello also surmises that this may be why his fastball has been getting hit harder too since it’s easier to adjust to without having to worry as much about the breaking ball. 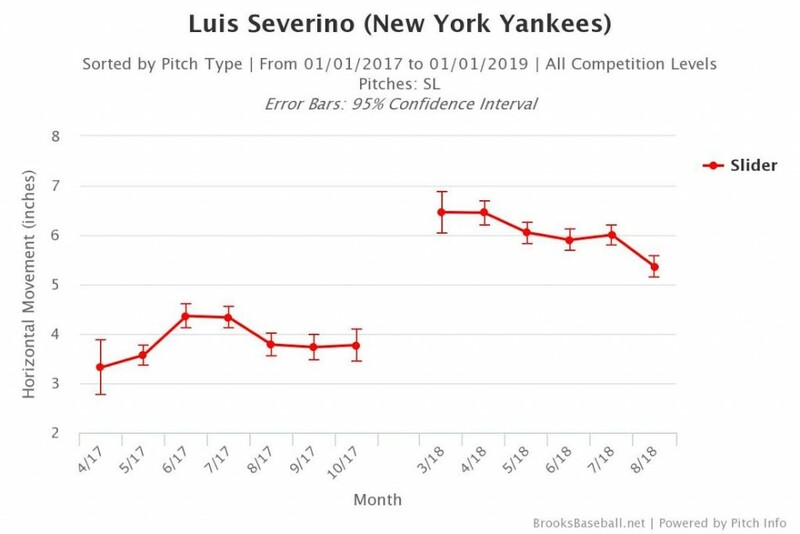 After reading Petriello’s article, I was curious to see how what Severino’s done lately compares to last season. I don’t recall Severino having much of a rough patch in 2017, if at all, and his monthly splits bear that out. In terms of ERA, his worst months were June (3.55) and August (3.82), which certainly aren’t bad. No other month had an ERA higher than three. That made me want to see if Severino avoided loss of movement and spin on his slider last season which allowed him to be strong all year. To my surprise, that wasn’t always the case. 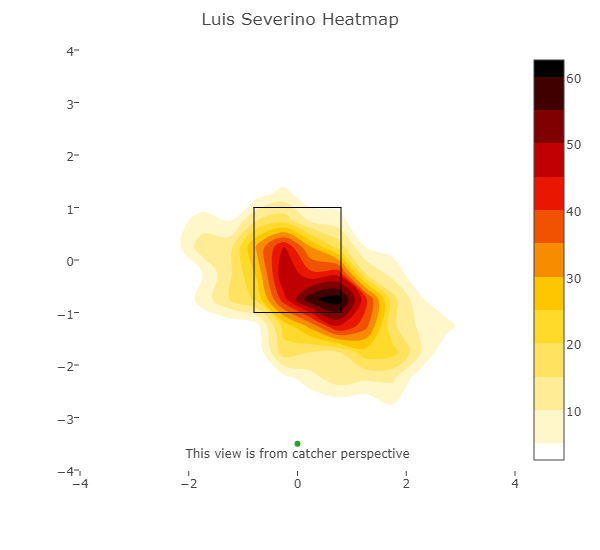 Starting with the drop of Severino’s slider, it’s evident that he experienced a very similar trend last year. To start both 2017 and 2018, his slider was falling off the table at its best. As each season went on, the pitch flattened. 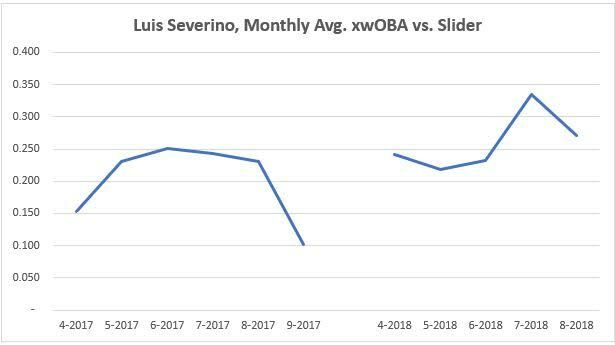 Similar to his vertical movement, Severino has experienced less horizontal movement on his slider as the calendar has turned this year. However, this didn’t happen to him last season. Yet, he still is getting much more side-to-side break on the pitch than last season. Looking at spin rate, and it’s clear that it’s fallen since earlier this campaign. Despite the decrease, the slider is still spinning much more than in 2017, though Petriello notes in his piece that spin rate isn’t quite as important to sliders as it is to other pitch types. With all of these issues for Severino in recent starts, one would expect more hard contact against the slider. Petriello noted the better results a, and below is a chart showing the monthly xwOBA in this year and last. Unsurprisingly, there’s a big jump from June to July in 2018. Last season, despite losing quite a bit of vertical movement on the pitch, batters didn’t fare any better against the offering toward the end of the year. With all of this in mind, it’s not easy to explain why Severino’s slider has done worse. 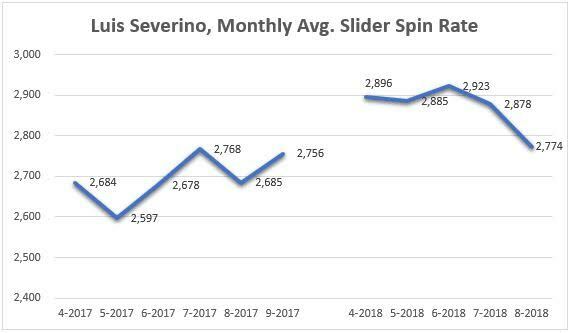 Yes, there are bad trends specific to 2018, but Severino still has better spin rate and horizontal movement readings than 2017, and his trend in vertical movement is much like last year. I’ll posit that it has something to do with that old real estate adage: location, location, location. After that, Severino started leaving his slider in the heart of the zone or way out of the strike zone much more often. 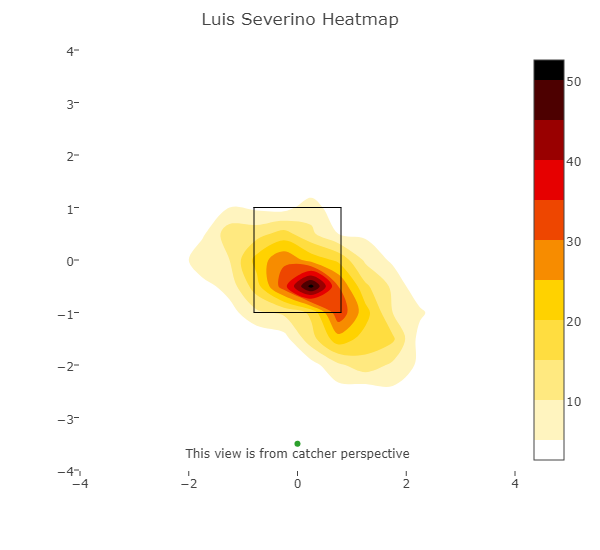 Movement and spin rate aside, it seems reasonable to argue that Severino’s trouble with the slider has come down to where it’s crossing the plate. Mix poor location along with less movement and spin (as compared to earlier in 2018), and you have a very hittable pitch. His fastball and changeup release hasn’t varied in the way that his slider has, not that this difference is anything more than subtle. But, perhaps this slightly lower release is making Severino groove more sliders. 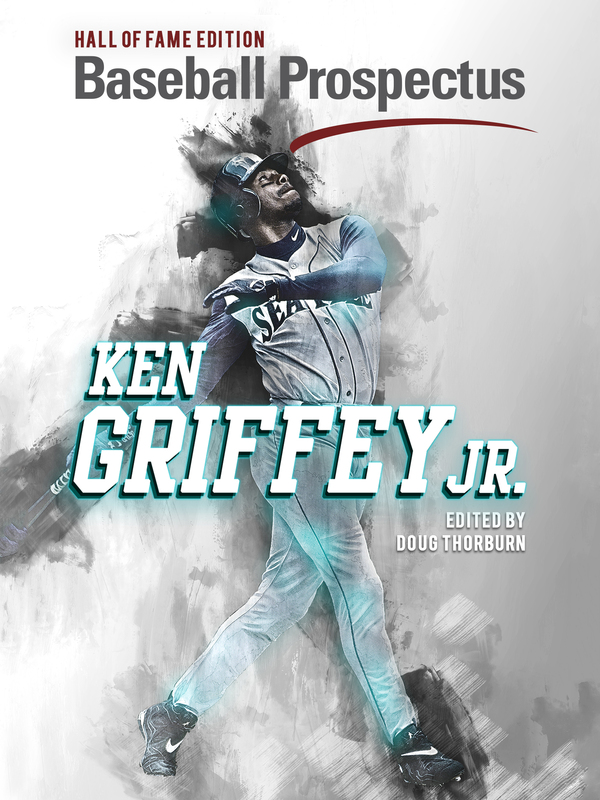 Further, maybe it’s making it easier for hitters to differentiate the pitch from his fastball. Though it’s been denied, it’s quite possible that Severino is tired, which could be making it a little more difficult for him to get on top of his slider. Fastball velocity is a decent barometer of fatigue, and Severino’s certainly appears to indicate tiredness. Since June, he’s lost a mile per hour on his fastball, whereas last season, he got stronger as the season advanced. The onus is on Severino and the coaching staff to get on track before the postseason begins. 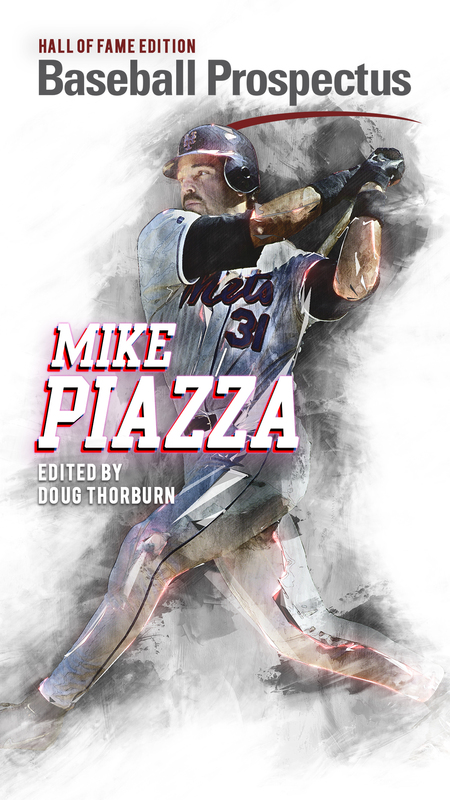 Hopefully, a mechanical correction or some additional rest are potential solutions, but time is ticking with the postseason rapidly approaching. As long as it’s not an injury, Severino should be able to right the ship before the Wild Card game, where the Yankees will likely end up. Sooner rather than later would be a lot more comforting, though.